It is time to rouse Miss Muesli from her end of year, stress-induced coma and stop talking about her in the third person. The first step on this journey toward muesli rejuvenation was to accept a surprising and uncharacteristic breakfast offer from Mr Tea, on the proviso that he would not have to choose the location and that he be picked up and driven there. Dads are great. So on a clear Summer morning, we visited Rathdowne Street. This would have to be one of my favourite streets in Melbourne, with its terrace houses and small shop-fronts bathed in dappled sunlight filtered through the giant trees – no urban heat islands to be found here. Our destination was a cafe called Two on Rathdowne, adjacent to Macpherson Street. Inside were tables displaying bits-and-bobs for sale, things that would make a place feel homely (which succeeded for the cafe) but are likely to be otherwise useless (which would not deter me). Also of note are the quaint hanging birdcage lights, which emit somewhat of a harsh glow so I would advise not to stare at them for too long. Nothing excites me more than a brown-tinged breakfast. To me, that signals that spices are afoot and although I do not have the palate to confidently distinguish between them, I always have a taste-tester on hand to tell me what exactly it is that I’m enjoying. I guess in that way I’m sort of the opposite of a paranoid Queen, in that I earnestly hoe in to whatever I’m presented with and only later do I try and work out what any peculiar (but rarely poisonous) taste may be. In this case the spice that could be identified was ‘juice’. Yes, these were sweet, juice-soaked oats offset nicely by the tartness of the poached raspberries and blueberries. The addition of sesame seeds, poppy seeds and sultanas gave this muesli a pleasing chewy texture and an earthiness that is a welcome addition to any oat dish. 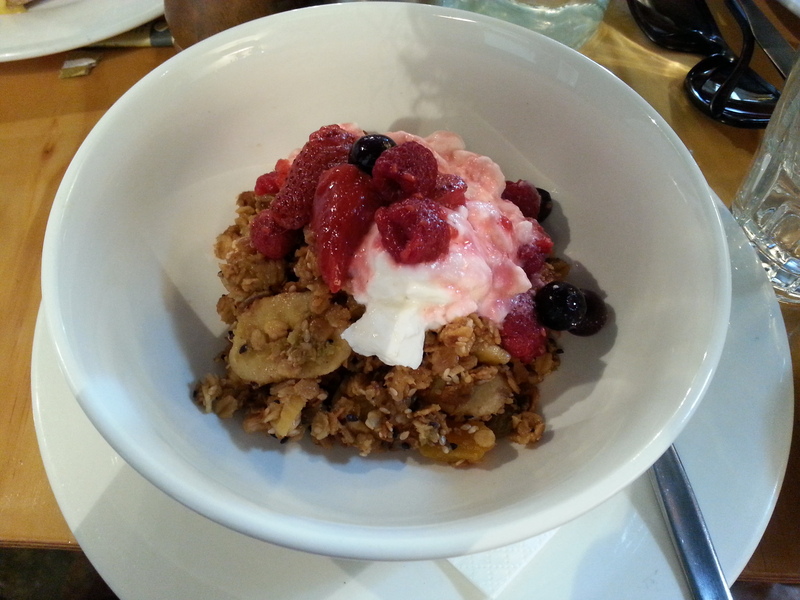 With this, Two on Rathdowne have created a solid, but not particularly remarkable muesli. Final Word: Have this muesli for breakfast if you would like a cool sweet treat to escape from the (ridiculously) warm Summer-morning sun.